Join us on a journey around the world this December with our exciting new advent calendar. On each day throughout advent we will travel to a different country in which MAF serves. 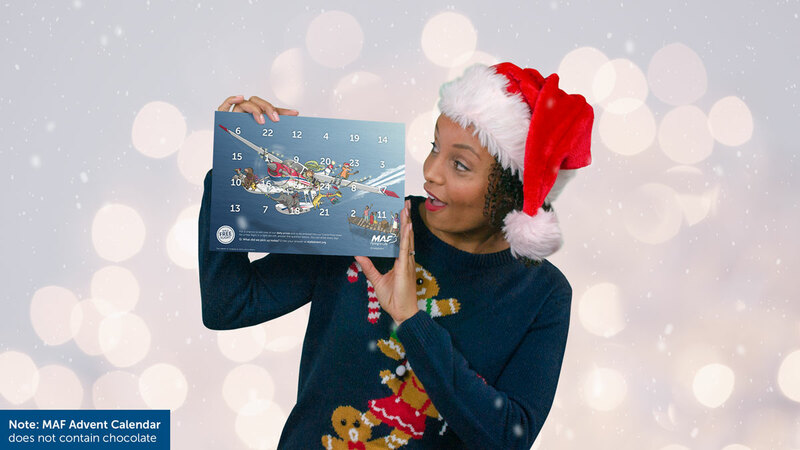 Open the door to your calendar to find out where we have travelled and see the daily clue, before visiting the website at www.mafadvent.org to complete your answer and discover more about the country. As well as the daily competition, there will be the next instalment of the Christmas story and a recipe or craft activity for you to enjoy for every day of Advent! Discover more of the world with MAF! Find out what it’s like to work and serve in some of the most isolated places in the world! Tick the box and, over the course of a year, you will receive a series of inspiring communications by post featuring updates from our pilots, real-life stories and fascinating facts. Your first stop… South Sudan! The Discovery Air Pass is designed for people new to MAF and not already receiving communications from us. By choosing to receive the Discovery Air Pass communications, we will no longer send you other printed materials, such as our Flying for Life magazine and prayer diary. *Offer subject to availability. UK only. Calendars will be dispatched by the end of November. Calendar does not contain chocolate!